Our most common electrical repair in the workshop is to replace a faulty jack socket. Jack sockets get a lot of abuse and if you’re a gigging musician, it’s the first part of the guitar that’s going to let you down mid gig if it’s at all dodgy. We replace jack sockets often and we only use the best quality Switchcraft jacks. Experience has taught us that it’s not worth saving a couple of quid to fit a lesser component. When your gig depends on your guitar working…the last thing you’ll want is an inferior component getting between you and that blazing guitar solo! For volume and tone controls..and here we use CTS, the same rule applies. You’re probably only going to fit a faultyncomponent once so make sure it’s the best. 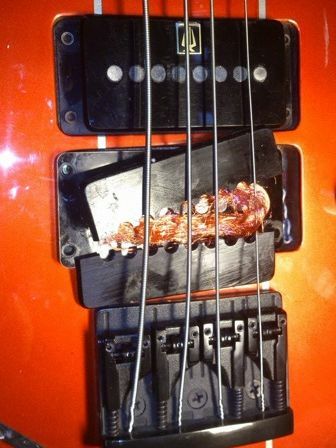 Do your pickups squeal like a Deliverance pig when you’re going for that epic lead solo …or… are your acoustic gigs more unlistenable than unplugged? Well, you’ve come to the right place. Whilst our most common repair is still a replacement jack socket or switch (they are after all the parts that get the most abuse)…we can carry out custom switching options to enable you to wring every last ounce of tone out of your guitar. Imagine a 5 way switch on your Strat with every position a custom option.. use your imagination…Jimmy Page did… and we can replicate his famous switching on your Les Paul or on any twin humbucker equipped guitar. About that squealing.. we wax dip pickups in house, totally eliminating microphonic feedback. Broken pickup? We can rebuild it… Rewinds, replacement covers, 4 conductor wiring upgrades for series/parallel/out of phase etc. Drop in and see Jimmy and the boys to discuss your requirements. Here we manufactured a new top plate to the identical specification and re-used the badge from the broken plate. Aaron Armstrong of Armstrong and Sky pickups then rewound the pickup to the original specification for us.